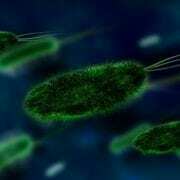 To many it probably seems counter-intuitive to intentionally introduce live bacteria into the human body. Bacteria causes disease, right? So, who would want to willingly introduce bacteria into their body? The reality is that trillions of bacteria — some harmful, some beneficial to human health — live in and on the human body. These beneficial bacteria are known as probiotics, and the growing body of evidences suggests that the balance of healthy to harmful bacteria within the human gut is critical to human health. Research suggests that probiotics influence immunity, digestive health, inflammation, allergies, mood, and nutritional status. Indeed, probiotics aid the absorption of calcium, fats, B vitamins, proteins, and phosphorus. To learn more about how these tiny organisms benefit human health, and what the therapeutic dosage is, read pages 99-100 of my book The Doctor’s Guide to Surviving When Modern Medicine Fails. Now, the question I am frequently asked — when is the best time to take a probiotic supplement. If you search the internet for this answer you are likely to get a number of varying opinions and answers. Some say to take them on an empty stomach, some at night, others in the morning, and still others say they must be taken with food. So, what is the right answer? As usual I looked to what science tells us about this question and applied the evidence to come to my conclusion. 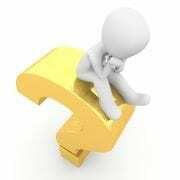 To answer this question it is first important to understand that probiotics are living organisms that must remain viable in order to provide a benefit. They must also be able to survive the acidic environment of the stomach and then colonize the intestines. Research suggests that probiotics are able to survive a stomach with a pH of 3 or higher. Unfortunately, the stomach has an average pH of 1-3 when empty, but it usually remains at a pH of 2 — too low for probiotics to survive. However, when food is in the stomach the pH rises as high as 4 or 5 pH, which is ideal for probiotic survival. This helps us answer part of our question — that it is best to take a probiotic with a meal. Now, to the timing debate. Is it better to take your probiotic in the morning or at night? Again, this requires a knowledge of how a meal affects stomach acidity (or pH). One study evaluated the effect of meals on stomach acidity and found that breakfast increases stomach pH to 2.5 to 3, whereas a high-fat dinner raised the pH to between 4.0 and 4.9. Interestingly, a spicy lunch induced a stomach pH of 3.0 to 4.2. The study authors concluded that a fatty meal had the greatest buffering effect on stomach acidity. That tells us that taking your probiotic with dinner may be best — as long as it includes some healthy fat. 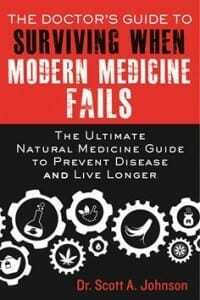 So, now we have a solid evidence-based answer as to when we should take our probiotic to maximize survival and effectiveness. The best time to take your probiotic supplement is with a meal and at dinner time, with some healthy fat. Now, one last thing before we leave the subject of probiotics. 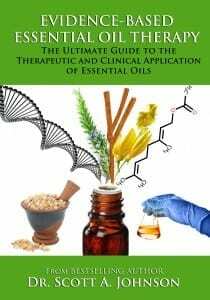 People are often concerned about how antibiotic medications alter intestinal balance of bacteria and if natural antimicrobials like essential oils harm friendly bacteria. It is unquestionable that antibiotics severely disrupt gut balance, and some researchers believe this alteration is permanent. Researchers have also investigated the effects of antimicrobial essential oils on probiotics and found some interesting conclusions. To discover these conclusions refer to pages 45 and 46 of Evidence-Based Essential Oil Therapy. 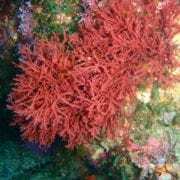 The Carrageenan Controversy: Harmful of Harmless? 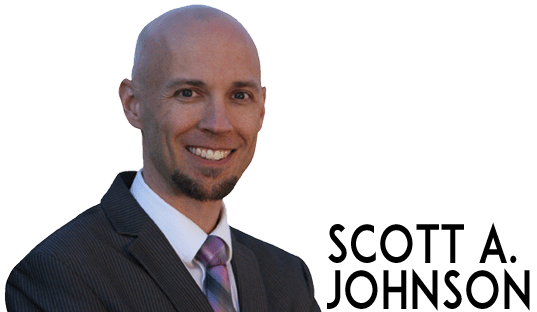 Glad I bought your books so now I can go look up the answer to “the effects of antimicrobial essential oils on probiotics.” Interesting article! A friend of mine is a holistic nutritionist. She told me the best time to take them is at night on an empty stomach. The reason for this, she says, is that if you take the probiotics with food, they will work on helping to digest the food. If you take them on an empty stomach, they will work on colonizing your gastrointestinal tract which is what you really want. This will help protect the lining of the intestines, which were never intended to have food particles touch them directly. She believes most food sensitivity problems come from this issue. 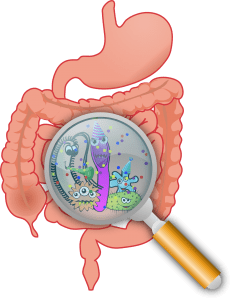 Before we started modifying our food and eating so many chemicals, we had basically a layer of bacterial sludge that lined the intestines, protecting them and assisting with digestion. 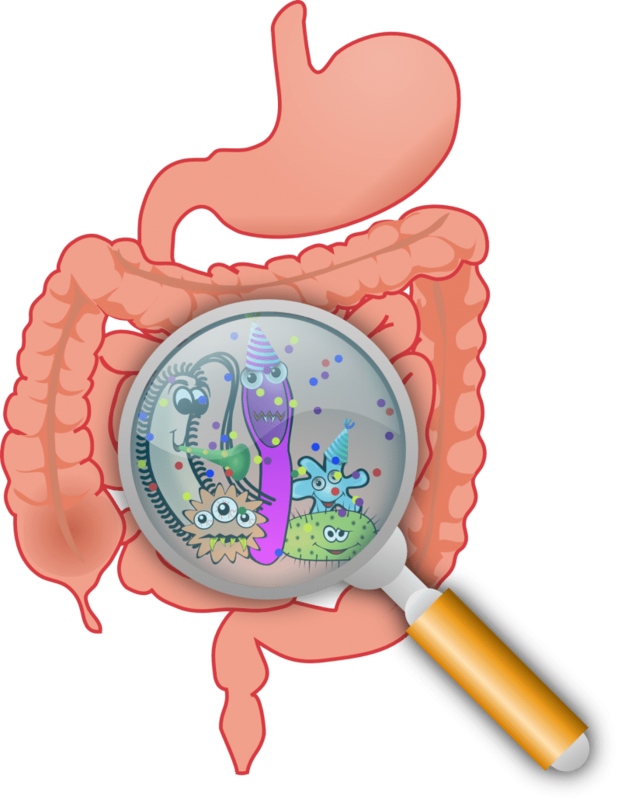 The toxic things that have come in contact with our intestines have gotten rid of this layer of bacteria. I’ve been taking my probiotics at night on an empty stomach for a couple of years now, and most of my gastrointestinal issues have disappeared. I can certainly see that point. Probiotics help break down sugars (polysaccharrides) and proteins (amino acids). However, much of the probiotics will be destroyed in the highly acidic empty stomach. In addition, humans have naturally ingested beneficial microorganisms (probiotics) with cultured foods for hundreds of years. It is also noteworthy that many clinical studies that demonstrated significant health benefits with probiotics administered them with foods.